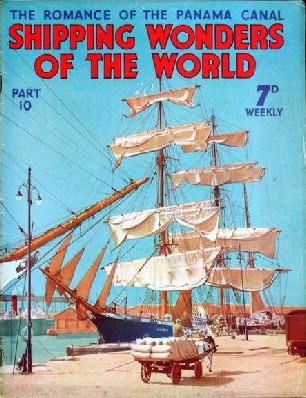 Part 10 of Shipping Wonders of the World was published on Tuesday 14th April 1936. It included a colour plate illustrating the clipper Lightning, which accompanied an article on the Record-breaker Lightning. The coloured plate was attached to page 301 of this issue. The cover on the current part shows the sailing vessel Killoran in Spencer Dock, Belfast. The Killoran, of 1,817 gross tons, was built in 1900 and sails under the Finnish flag. She is owned by that well-known sailing ship man Gustaf Erikson. In the foregraound of the picture is the bowsprit of the Herzogin Cecilie, also owned by Erikson. The Killoran is also illustrated in the article on Mariehamn’s Grain Fleet in part 24. The concluding part to this chapter describes the salvage of the liner St Paul, which heeled over in New York harbour from a mysterious cause. You can read more about this salvage in chapter XII of David Masters’ book The Wonders of Salvage.This is the third article in the series Dramas of Salvage and is concluded from part 9. An account of the early developments of power propulsion, and of the many successful experiments made in Great Britain and elsewhere between 1630 and 1820. The article is by F E Dean, and is the first article in the series Marine Engines and Their Story. The methods of launching a ship varying considerably and the ceremony, as this chapter shows, occasionally involves the use of astonishing innovations. The article is by Frank Bowen. Having abandoned his profession as a civil engineer, Alain Gerbault sailed a 39 ft yacht round the world. Though several times death all but claimed this fearless adventurer, he achieved an astonishing triumph. This chapter is by Sidney Howard and is the second article in the series Great Voyages in Little Ships. Designed and built in the USA for English owners, the Lightning was one of the most famous of the racing clippers. The Lightning was a remarkable ship. She made a homeward run from Melbourne to Liverpool of 64 days 3 hours 10 minutes in 1854. Outward bound in 1856, this clipper covered 2,188 miles in seven consecutive days. Later the Lightning made a wonderful passage to India with troops to help in quelling the Mutiny. The article is by Frank Bowen and is the third in the series Speed Under Sail. The great artificial shipping lane separating North and South America is an unparalleled engineering triumph. Its construction cost about £75,000,000 and changed many of the world’s important trade routes. The length of the canal is just over 50 miles. It was opened in 1914, but it was not in regular use until 1916 because of landslides. To-day the biggest ships can pass along the Canal. This chapter tells both of the present-day working and conditions of the Canal, and also of the determination and endurance which helped to build it. This article is by Sidney Howard and is the third in the series on World Waterways. Click on the small image to see a British Pathe newsreel clip “An Imposing Spectacle” showing the USS Colorado, the largest vessel in the US Navy, passing through the Panama Canal (1924). Stories of men who have not only had amazing escapes from death, but who have also performed feats of unforgettable gallantry. The article is by Lieu.-Com. E Keble Chatterton and is concluded in part 11.